I’d call it a light email day when I have 54 unread emails in my inbox. Oh, what a perfect world it would be if I actually had time to open each email, read its content completely, click the call to action and then actually follow through on said call to action. As it stands, instead, my email process involves a drudgery of clicking that cumulates in a virtual Chrome tab “to-do” list that I honestly mean to attend to, but usually end up losing in an emergency restart I have to perform when my computer fails from having too many tabs open. How does this affect you? Well, if you’re National Geographic it means I’m probably never going to get around to renewing my subscription for next month, and if you’re my uncle it means that your RSVP to my niece’s quinceañera just got lost in the cyber shuffle. I imagine someone at Google had this same problem, because last month Google announced Schema-powered “quick action buttons” that allow you to RSVP to events, review products and services, and take action on a CTA without having to navigate away from Gmail. In fact, you don’t even have to open the email — the one-click button is rendered right in the subject-line view. This quick-action button shows the In-App RSVP Action schema being used via Google Calendar. Image from Google Developers. Google says this new addition is intended to “help you tackle your digital to-do’s as quickly as possible” and I think they might really be on to something. 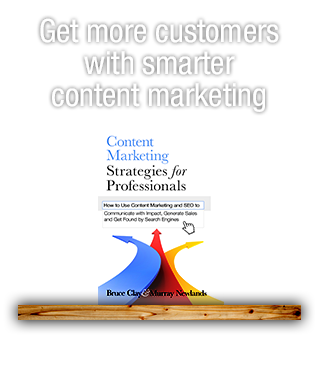 From a marketing perspective implementing one-click buttons allows you to skip steps in the conversion process, take advantage of the “impulse buy” opt-in, and, generally limit the number of hoops your patrons have to jump through to do what you want them to do (newsletter double opt-in emails immediately pop into my mind). Keep reading to learn more about the details of how email schema works, or, if you are already familiar with the nuts and bolts skip to the conspiracy theory hypothesizing section below to do some imagining with me about the theoretical future of email schema. 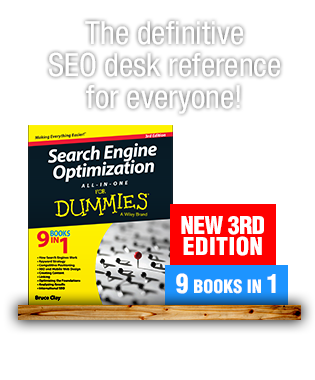 1) Google refers to these subject-line email buttons as “quick action buttons.” Quick-action buttons are powered by Actions or Interactive Cards that are defined by schema, the open-platform markup language that optimizers have been using to influence the Knowledge Graph and Rich Snippets for years. Right now the quick-action buttons only render in Gmail, but since this project is schema-based other email clients can adopt the technology and begin rendering buttons that reflect their specific email experience at any time. Right now, if an email with schema markup is sent to an email client that does not support Actions, the markup will simply be ignored with no negative effects. 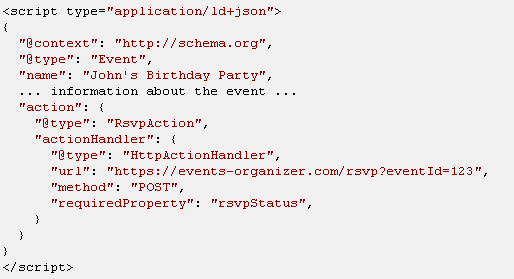 An example of email schema designating an RSVP Action. Notice the JSON-LD script commands that begin and end this chunk of code. Note: Google is very specific in communicating that some of the schemas used by Gmail are currently not part of the schema.org standard vocabulary, and, therefore, may change in the future. Google says when that happens they “will try to make any necessary transition as smooth as possible to all developers using these schemas as well as to their users.” Learn more about the current state of email schema proposals. 2) There are two types of quick action buttons: In-App and Go-To Actions. In-App actions render buttons that can RSVP to events, submit reviews with star ratings and text comments, and perform one-click actions such as renewing a subscription or saving content to an external website queue (think NetFlix or Spotify). Go-To Actions are one-click subject-line buttons that send traffic to external websites. This type of Action is used when the task has multiple steps, or is too complicated to be completed in one step – like checking in for a flight. More actions will be added to the schema.org standard vocabulary down the line. 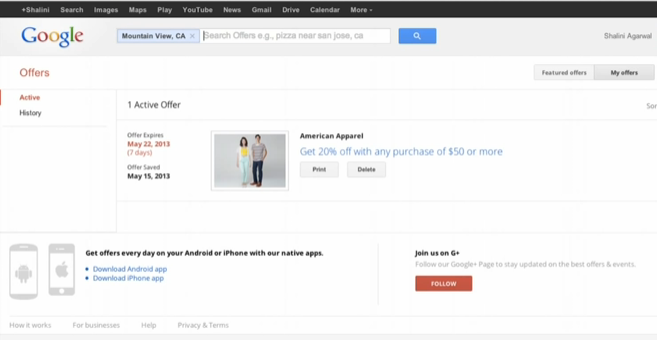 In this example from the Google I/O conference live demo we see an email from Google Offers that extends an American Apparel coupon using a “Get offer” One-Click shema. Gmail also supports one Flight Interactive Card that allows you to perform several flight conveniences directly from your email including cancel a flight, confirm a flight, and check into a flight. This Flight Interactive Card is a schema all its own and is not an Action. 3) Each button can only be interacted with one time. So, using a National Geographic magazine subscription renewal schema as an example, if you click the “Renew subscription” button the request will be sent to National Geographic, National Geographic will complete the request and confirm with Gmail that the request was completed, then the button will refresh to show a check mark next to the button label. A check mark appears to confirm you have clicked a One-Click quick action button. In this example, after you click the “Get offer” button (shown above) the schema is set up to automatically save a coupon to the user’s Google Goods account. 4) The email client controls the user experience of the button, which means that you simply define the parameters of the Flight Interactive Card, or which of the four Actions you want the button to perform (RSVP, Review, One Click or Go To), and the client (for example, Google) will generate the experience. In other words, you can’t make your buttons pink or circle shaped. Other button “rules” include: One Click and Go To button labels must be short and concise, reflect a clear action to be taken, and should not contain punctuation or all capital letters. These guidelines only apply to One Click and Go To labels because RSVP and Review actions have labels already designated by Google’s client-style (naturally, they say “RSVP” and “Review”). At the I/O conference Google promised that they were making every effort to turn these registration requests over quickly. 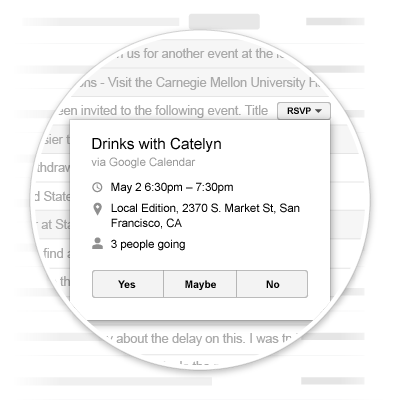 6) At the I/O conference demo Google representatives did show an example of a Google Calendar invite automatically generating and sending an RSVP Action. I bring this up because this Google Calendar RSVP Action represents the only scenario (that I could find as of now) where a) Google writes and implements the semantic markup for you, and b) everyday people are able to send email schema on a small scale. What Do I Think Of Email Schema? From a personal perspective, as a habitual email evader and tab abuser I am excited about one-click buttons that allow me to complete tasks quickly without having to open emails. As an impulse buyer, I can also see how this implementation could impact (the emptiness of) my wallet in the same way that Amazon’s 1-Click ordering has. As a marketer and a copywriter I’ll admit one of my first thoughts was “…but, what about those words and images inside the email? Are they just dust in the wind?” then an incoming email popup reminded me that people get a lot of email and, simply put, either they have time to look at them, or they don’t. If your recipient doesn’t have more than one-clicks worth of time the email is getting ignored anyway, so the one-click option can only help your campaigns. Plus, empty consumer wallets means full corporate wallets and paychecks for copywriters. 1) Will Email Schema Influence SERP Order? The schema we currently use to define Rich Snippets and Knowledge Graph data for search engines doesn’t necessarily improve SERP rank, but it does encourage interaction, which, because of search history personalization, can make websites show up more or less often and higher or lower. So, do we see Google taking cues from interactions with email schema to influence what shows up in personal search engine results pages? For instance, if I rate the restaurant Allison’s Country Kitchen 5 stars, Google could take that as a signal that I have been to the restaurant and that I liked it. With that information when I search for “Ventura County Dining” or “Breakfast places in Ventura,” Google can take into consideration my email schema restaurant ratings to better understand my preferences, which could make the Local entry for Allison’s show up (with map! ), or a link to the restaurant website appear higher on the page. Your thoughts? Feasible, this will happen for sure, or probably not? 2) Will Google Bring Zagat Reviews to Gmail? Can Zagat and Gmail and Squarespace Have A Baby? Right now, according to Google, email schema review information is delivered to “third party” vendors via markup designated by the email sender. Now that Google owns Zagat, and with the recent addition of Zagat reviews to Google Maps, I wonder if Google will make one-click Zagat reviews the standard in email schema? (The Zagat blog says: “And this is just the beginning. We have quite a bit in store for the next generation of Zagat within Google.”) Second theory: I wonder if there is a way that the Zagat/Gmail twosome could team up with someone like Foursquare to have an email sent, say, four hours after a person checks into a restaurant asking them to review the restaurant or rate their experience with In-App Review Action. Thoughts? Feasible, or probably not? Hi, Oytun! The prospect of having a more dynamic email experience is exciting, isn’t it. Any thoughts on what kind of email schema campaigns you will run? 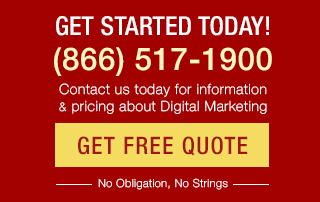 Are you headed in the direction of one-click purchasing, renewals, coupon opt-ins or something completely different? I have just discovered Email Schema this morning and already working on it to integrate in my app. I find it quite a valuable feature, for users, developers and business. And it is really exciting to be able to enrich email interactions like this.